Amoda in Bukit Bintang is located on Jalan Imbi, adjacent to Melia Hotel and just opposite the well-known Berjaya Time Square mall. 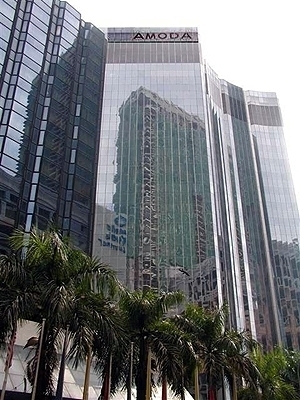 The building was designed as a state-of-the-art intelligent office glass tower within Kuala Lumpur Golden Triangle district. Amoda is strategically located and accessible through Jalan Imbi and to major expressways such as the Lebuhraya Bertingkat Ampang-Kuala Lumpur Elevated Highway (Prolintas Expressway AKLEH), the Middle Ring Road 2 (MRR2), North South Highway, easy access to KLIA-Putrajaya Highway via Jalan Tun Razak, Kuala Lumpur Seremban Highway, SMART expressway, and also the DUKE highway. In addition, the Amoda building also provides its tenants with convenient access to public amenities and township facilities such as Melia Hotel, Berjaya Times Square, Sungei Wang, Pavilion, Bukit Bintang Plaza and Suria KLCC. 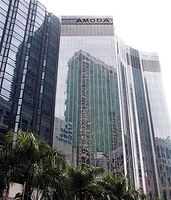 Amoda is also located near Bukit Bintang and Imbi Monorail stations and RapidKL Hang Tuah LRT Station, with lots of taxi services and bus companies servicing the route via Jalan Imbi or Jalan Bukit Bintang, as well as various entertainment outlets and restaurants and eateries to choose from within the vicinity.